This month it's all about nurturing! It's cold, it's wet and it's time to look after ourselves with some lovely wellness and soothing products, so let's see what's in the box this month! 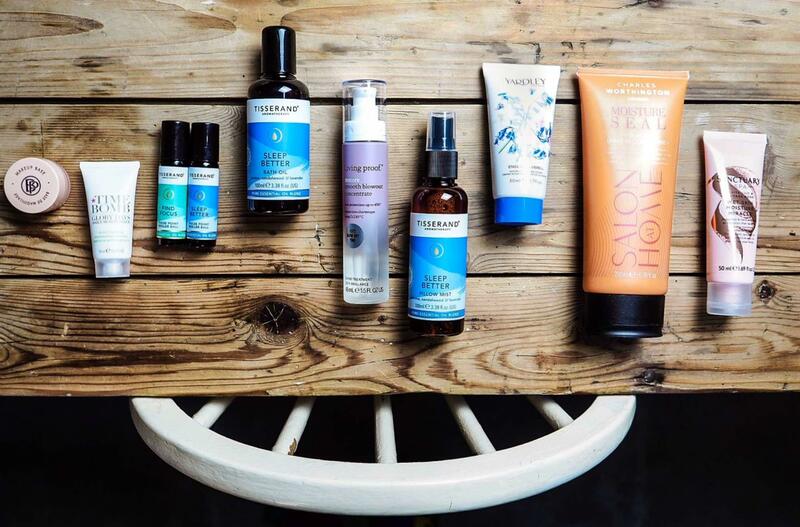 Tisserand is one of the oldest aromatherapy brands in the UK. Since 1974, they've been sourcing pure essential oils for health benefits way before almost any other brands were harnessing these powers for their ranges. Not only that, Tisserand has kept their prices highly affordable, so when I wanted wellness products, I thought immediately of them. It's run by a team of really lovely people as well, which is always a bonus. For this box I started with Tisserand's Sleep Better Pillow Mist (100ml/ £8.95). I love pillow mists, particularly at this time of year as the lavender and jasmine in this one is just so soothing. If you struggle to get to sleep it can be a real help. I've coupled this with the Sleep Better Bath Oil (100ml / £8.95). Bath's are one of the greatest treats in the world and this gorgeous bath oil means that you get to relax, soothe your soul and then pop into bed with a bit of misting on the pillow. You can't go wrong. I've also included two Tisserand Roller Balls. These are aromatherapy oils for on the move and I keep mine in my handbag. The first, Find Focus (10ml / £5.95) I use at work around about 3pm when my energy falls a bit or when I'm about to embark on something that's been sat on my desk as a deathly dull task that actually now needs doing. The second rollerball Sleep Better (10ml / £5.95) I have for long train journeys, flights and car journeys where I'm being driven around (not often, I accept that). It also gets "borrowed" by my sons when they're tired, as I'm not giving up my Pillow Mist! As we're in a nurturing mood, I've popped in two hair products, Charles Worthington Moisture Seal Conditioner (200ml / £6.99) and an absolute luxe product, Living Proof Smooth Blow Out Concentrate (45ml / £26.00). Both of these are gorgeous hair products that just make a pre-bed ritual even lovelier. In the bath, wash hair, smooth before blow dry, mist pillow, bed. How lovely is that? Living Proof used to be part owned by Jennifer Aniston - bit of beauty trivia for you. I chose Yardley Hand Cream (50ml / £2.99) for another pre-bed ritual, but hand cream is used all the time these days. Yardley is such a heritage brand and the products are fantastic. I'm meeting with them next week as I just love the ethos of this brand and how it is just so English. I'm very excited to see what they've got happening for 2019. The final three products (yes it's a box packed with TEN products this month) are Time Bomb Glory Days Moisturiser (15ml / £12.00), Bellapierre Make Up Base ( 7g / £10.00) and Sanctuary Spa Wet Moisture Miracle in White Lily and Damask Rose (50ml/ £2.00) . The Time Bomb I chose as this is a great moisturiser and while I know we did skincare last month, this is hand luggage size and should go in your travel toiletries bag as it's perfect for that. The Bellapierre looks like a diddly little pot, but here's what I'd use it for, as an eyeshadow base. I scoffed at eyeshadow bases for ages, until I used one and it is a game changer. Suddenly, eyeshadow is even and stays longer, without creasing. Try it! The Sanctuary Spa is for you to test as basically, it's saying it will save you using body lotion after your shower. Give it a go! So that's it for this month. Hope you love it, hope you enjoy the products and see you in March!